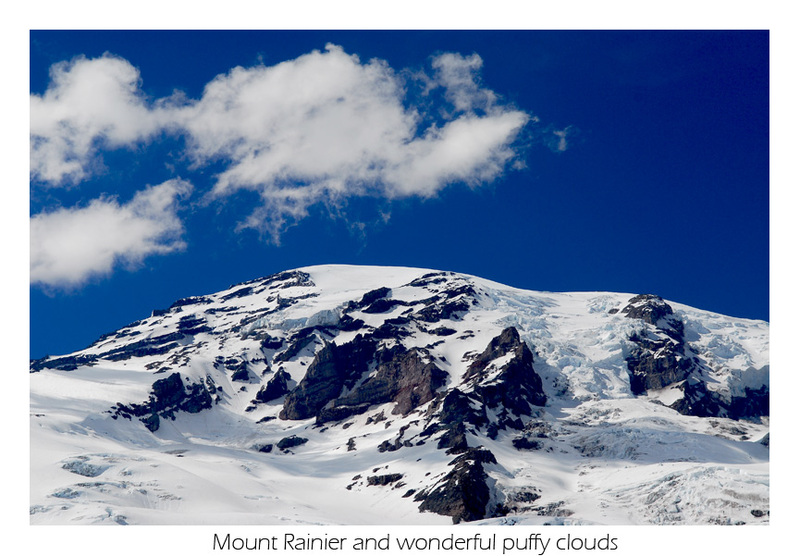 With all the snow in the lowlands you'd figure Mount Rainier, a mountain that gets more snow than almost anywhere else, would be looking better than average. Higher on the mountain this wasn't the case. 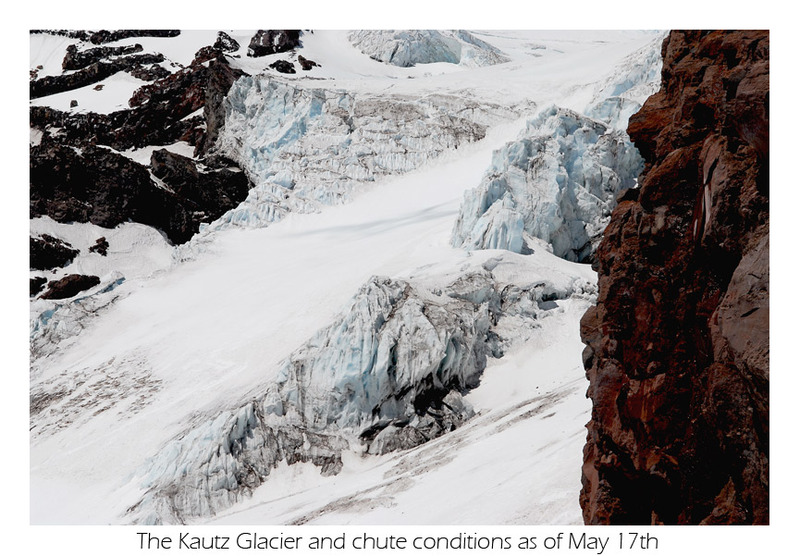 Most routes fared poorly this winter with glaciers more crevasse-riddled than in other years. In contrast, lower on the mountain, snows are deep, well above average. I could only guess that high winds are to blame. Looking at the new Camp Muir weather station data throughout the season with its ever common (when it didn't freeze up) 100+ mph reading, this guess would be well-based. 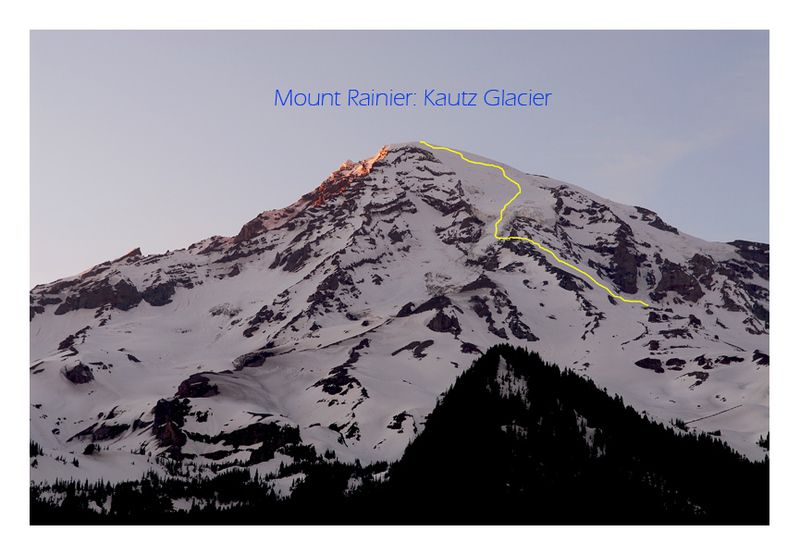 On Friday after work, I was to make my second attempt on Rainier this year. 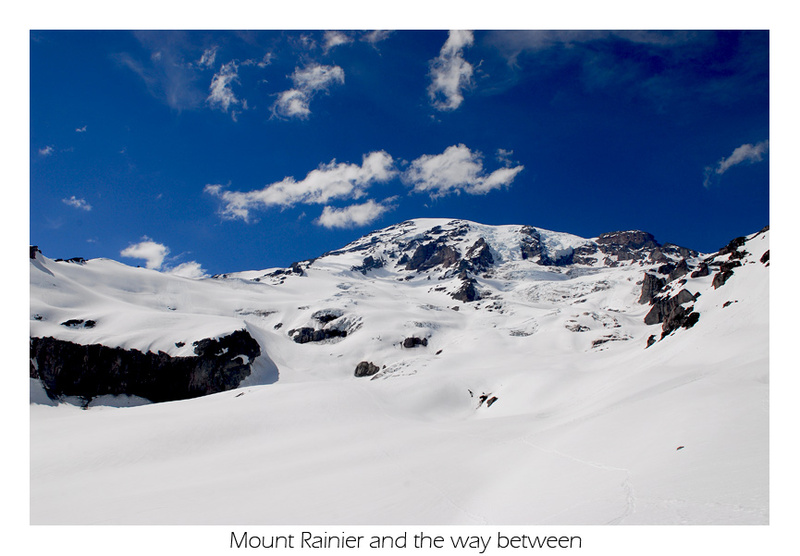 Like my first climb, it was a spur of the moment decision brought on by Sky whose single-handed efforts have laid tracks down almost every route on the south side of Mount Rainier. 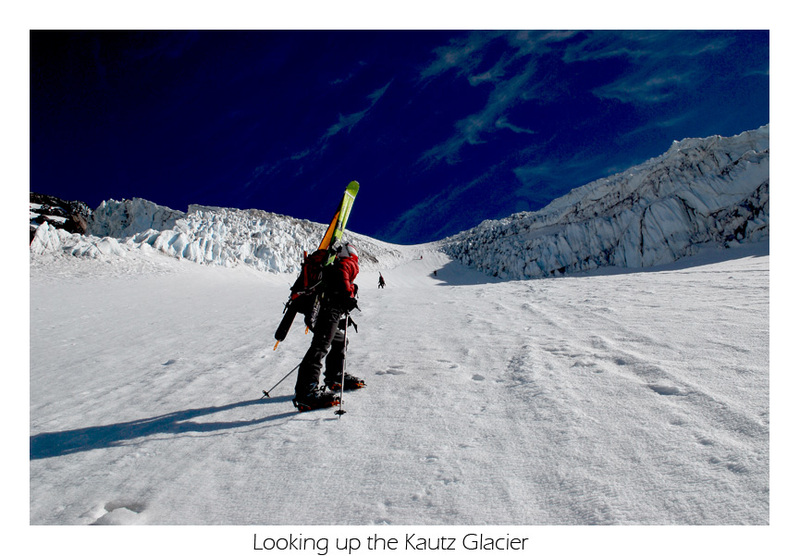 This includes the Kautz and Wilson Headwalls, both the Fuhrer routes (finger and thumb), Success Couloirs and the Kautz Glacier. 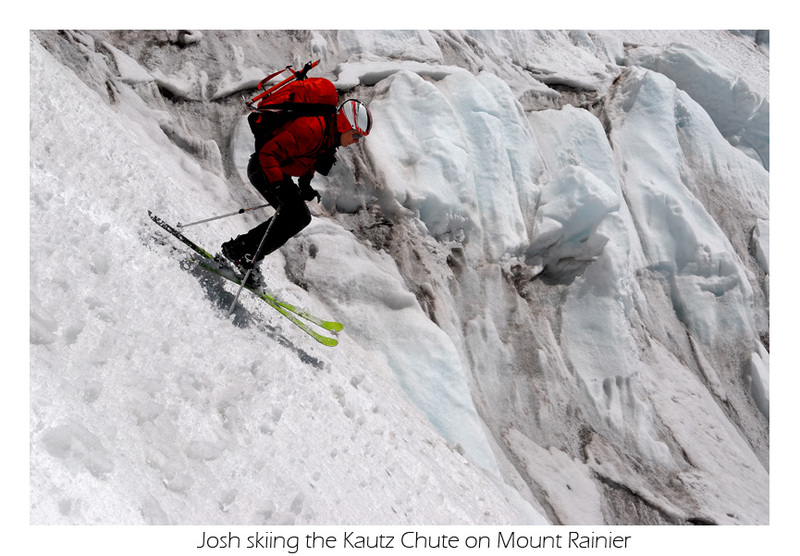 According to him the Kautz Headwall is the finest example of a steep, continuous line on this side of Mount Rainier. Josh and I got a closer look of the route during the drive to Paradise. What we saw were cliff bands separated by snow (or is that snow separated by cliff bands?). This wasn't looking like a good choice. At the parking lot it was easy to contemplate trying something else. Taking a nap I woke up and asked my brother what time it was, "11:40," he grumbled. Sky was late and he was supposed to be there at 10pm. Since the day was to be very warm, it didn't seem wise to linger, so we left a note. On it we said we were going to go climb and ski the Fuhrer Thumb. 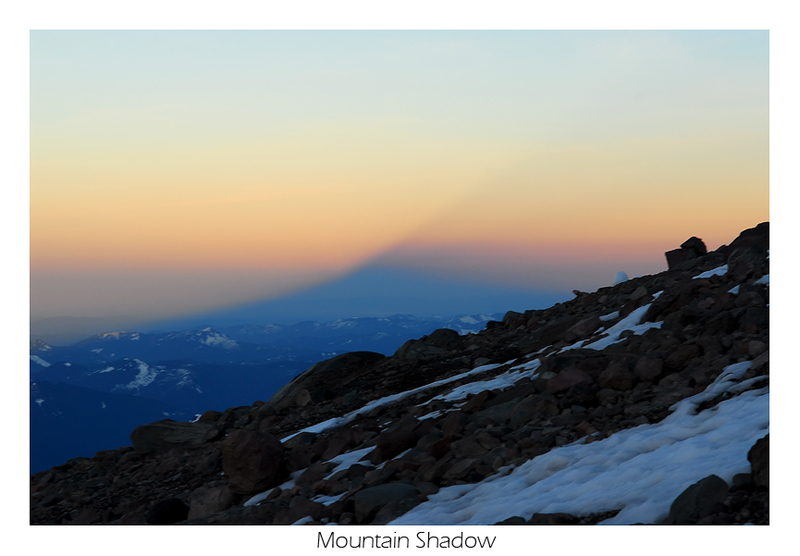 Many nights on Rainier have little to compare with this one. 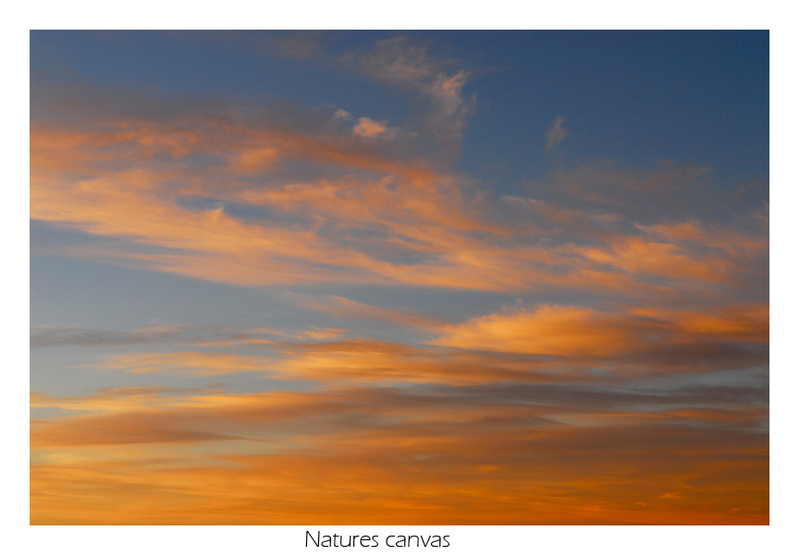 A bright moon and cold/warm blasts of air lifted tired eyelids and carried me up the mountain. At Glacier Vista we descended on gloppy snow. Until then, the snow had been a few inches deep and consolidated. With the expected record temperatures to lay over most of the state that day, there was concern. 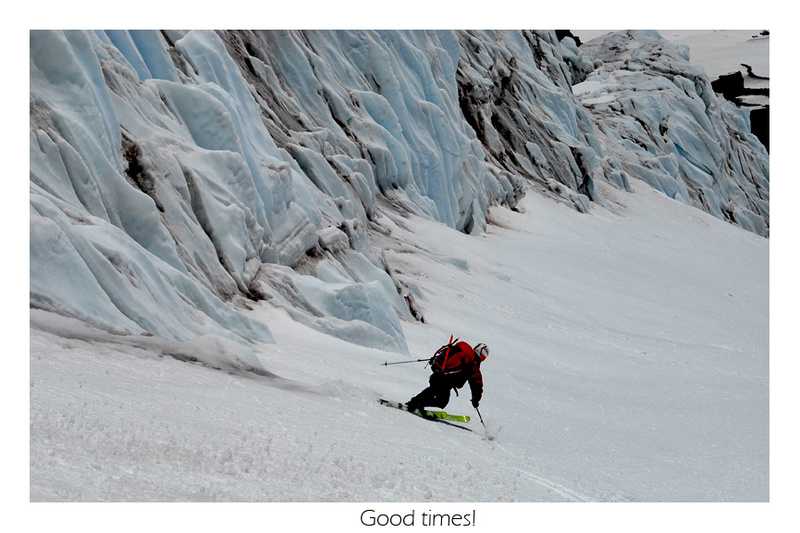 Fortunately, back on the glacier conditions were better. 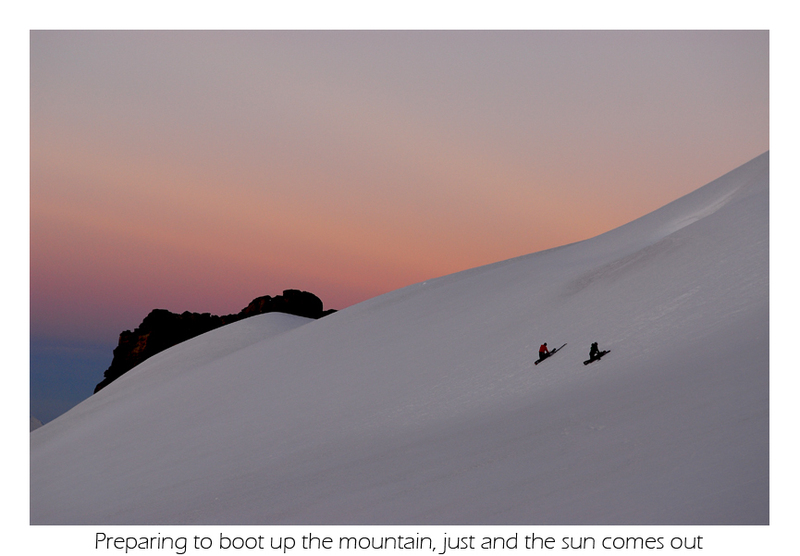 Winding up through a glacier in the middle of the night is an intimidating endeavor no matter who you are. Groaning seracs and gaping crevasses appearing all the more fearful in the moonlight. 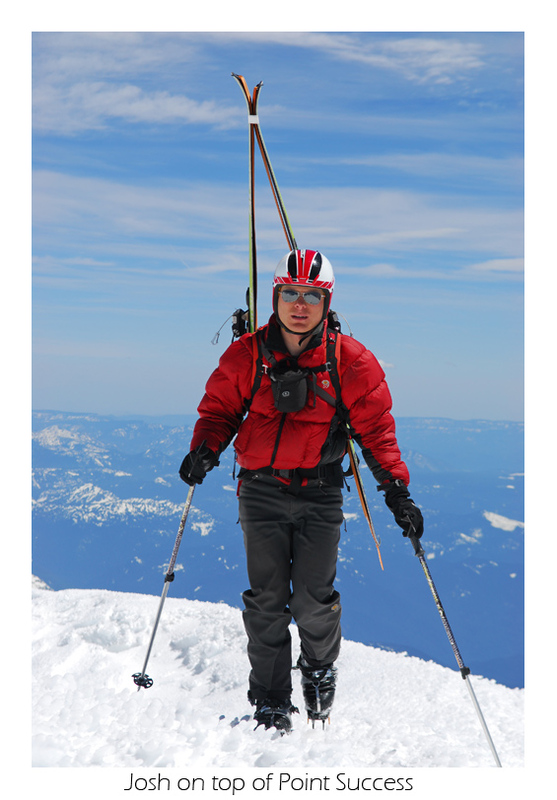 Josh and I were not pleased to be crossing any crevasses in such soft snow (in places your ski pole could be pushed down to the hilt). We went out of our way to avoid any and all, but didn't manage to avoid every single one. 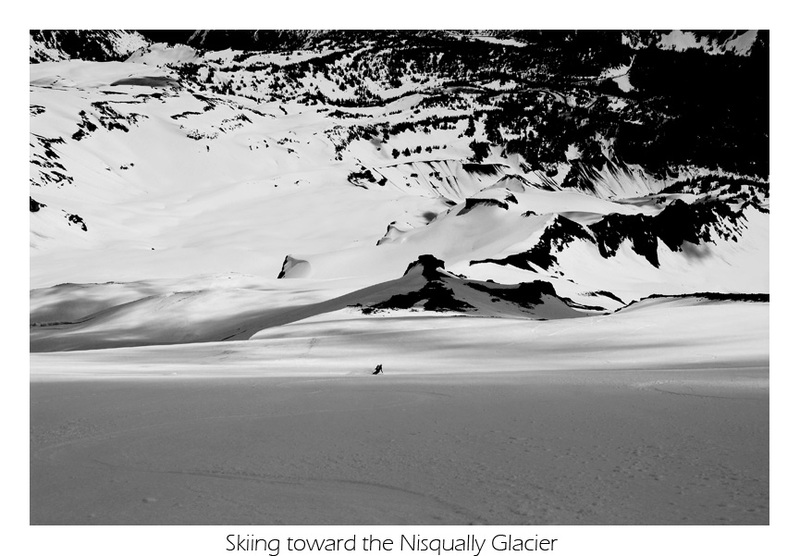 The few snow bridges we had to cross reminded me of the skiers fall on this very glacier a few weeks prior. As I understood it, he fell nearly a 100 feet headfirst AND survived. Later being pulled out practically uninjured!!! 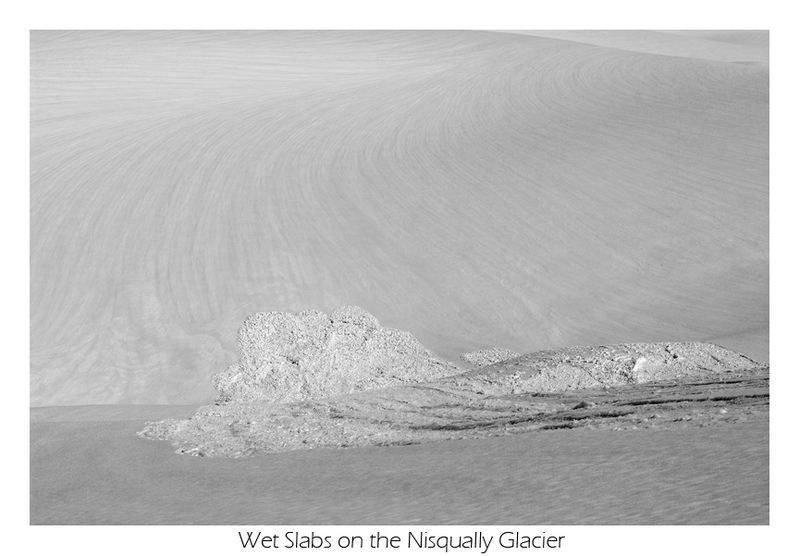 And with, surely, an increased respect for this glacier. Other easy ascents through here had increased my confidence. 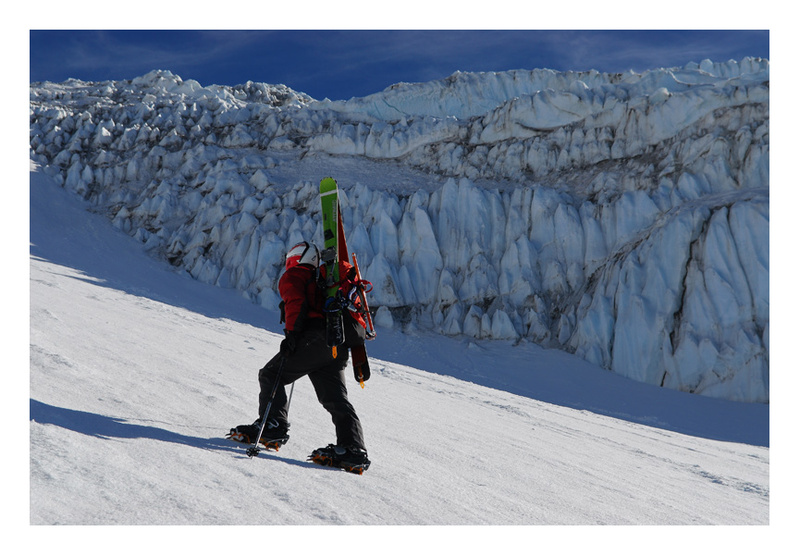 I don't think I will ever go directly up the glacier again without a rope on such soft snow. Better instead to avoid all of it by going up the fan and Turtle. 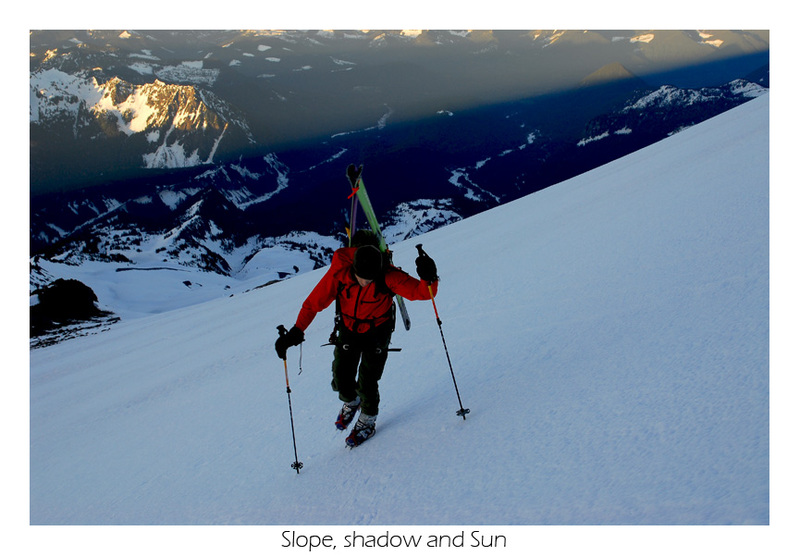 Above the glacier below the Wilson Headwall, a light followed by two others appeared. It looked as if our party had finally arrived. Since they were far behind a nap was in order. By no means did we actually get any sleep, cause by then the wind had begun and was just cold enough to keep us awake. Instead we just hunkered down on the cold snow and waited. Beside my short nap at the parking lot, I hadn't slept in 20 hours, the price of a one-day push on a saturday after work. As Sky, Eric and Casey arrived, we talked about plans. 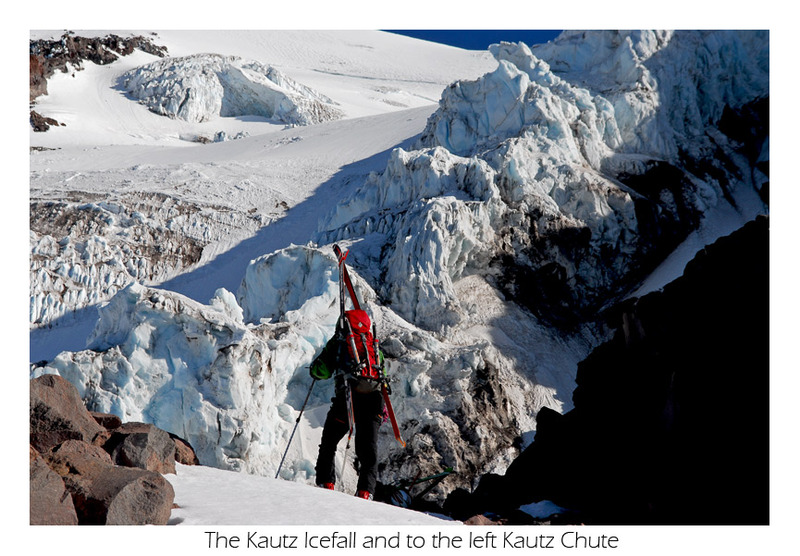 They, too, didn't like the look of the Kautz Headwall and given the late hour, they had decided on the Kautz Glacier. This seemed reasonable. As to why they were late? Many foibles are to blame to include Casey making a wrong turn on the way to the mountain. 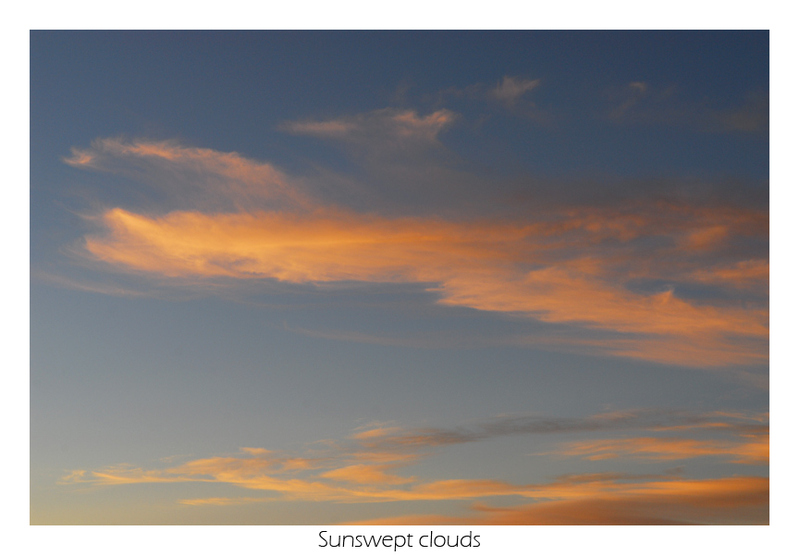 Sunrise was nice, even though most of it occurred around the east side of the mountain. As soon as any sun reached the rock and ice walls, a few ice chunks would skitter down. Fortunately the wind wasn't so loud you couldn't hear them, offering enough time to make necessary adjustments to the right or left. 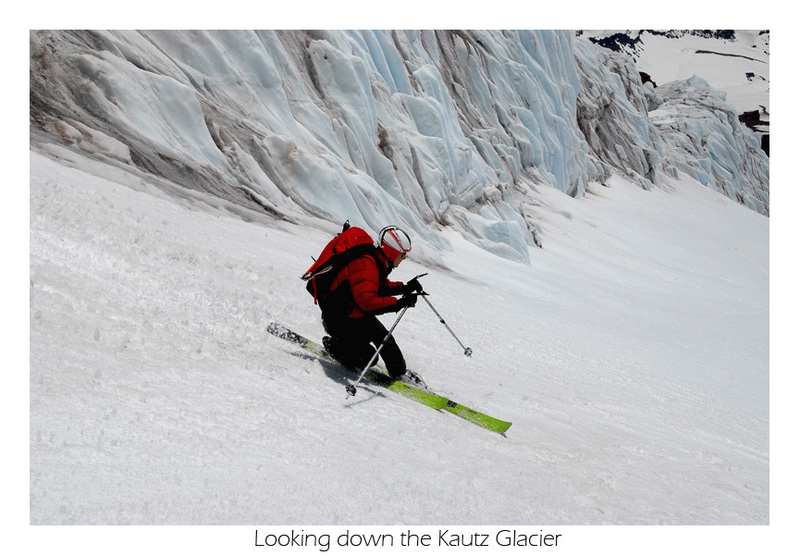 There are two ways to get onto the Kautz Glacier both within a few hundred feet of the ice walls. 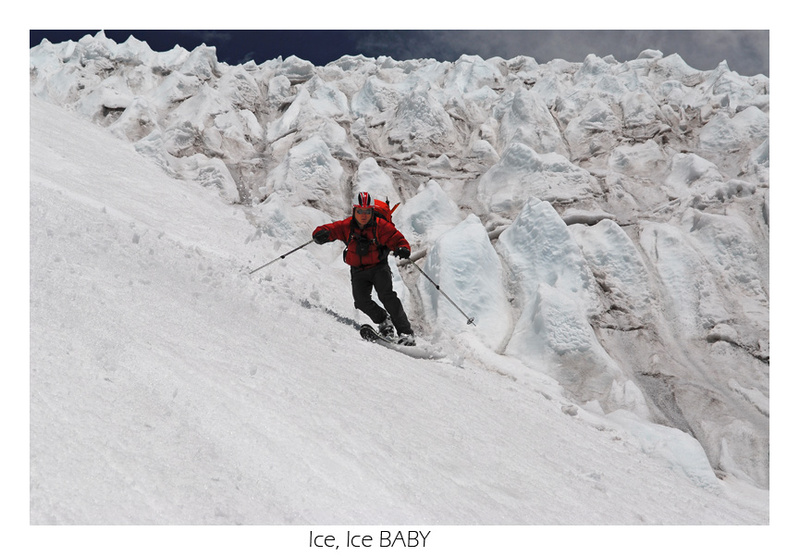 One is a fixed line and the other requires you to traverse easy rock and drop quickly around a toe in the ice. Since we missed the fixed line, we took this route. The chute was very fun to climb and according to Sky you couldn't ask for better conditions. Good time was made through here and I was looking forward to skiing a route I hadn't done before. 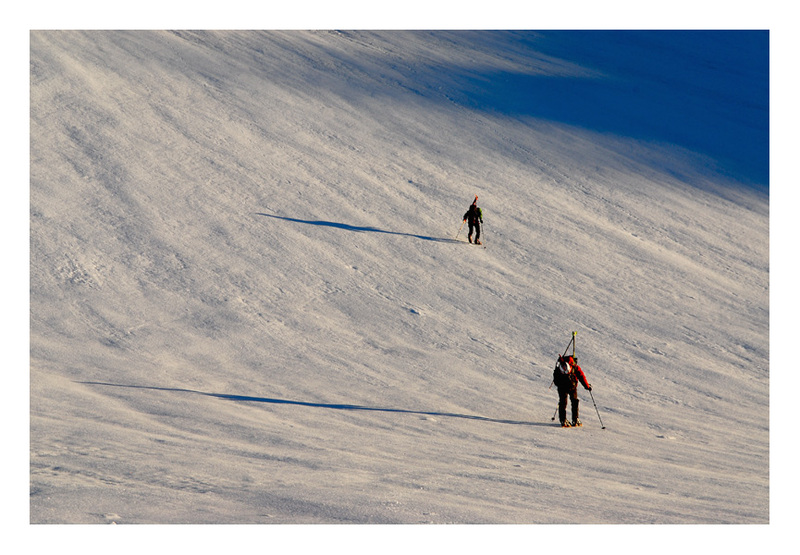 The upper snowfields are quite gentle but with miles of slopes hanging below, they feel much steeper, especially when you are on harder snow, which was persistent throughout the upper slopes. The consolidated nature of it was good for booting and would be spectacular for skiing with a little more sun. 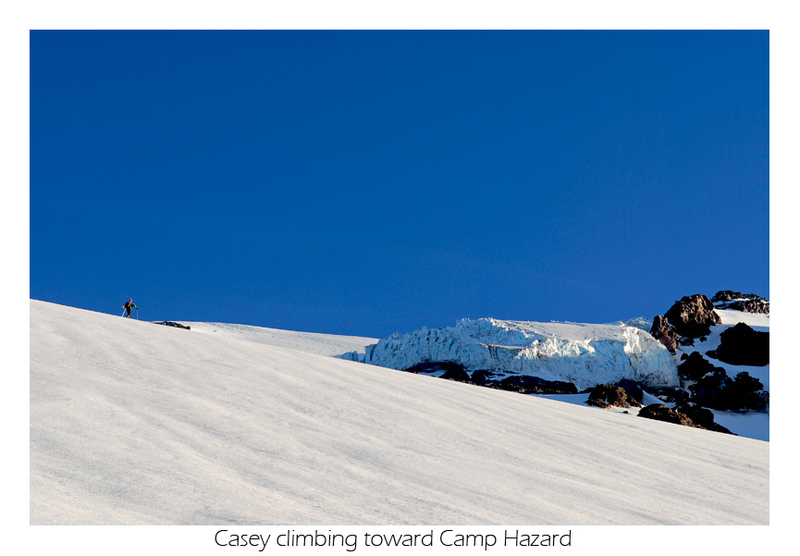 About a 1000-ft below the summit, Casey turned around. He wasn't feeling well, this from a guy who climbed-skied Liberty Ridge in a day from the Carbon River (some days it just ain't your day)!!! He wasn't alone, Josh and I were moving much slower. It took convincing, but Josh joined me for the last bit of the climb. A short rest just before, had put us behind Sky and Eric who were working there way up the last few hundred feet. An hour or more later, the summit came into view. I didn't go for the true summit which has no great ski lines off the top. More than anything it is a rocky crater with a high part to one side, which is considered the top. 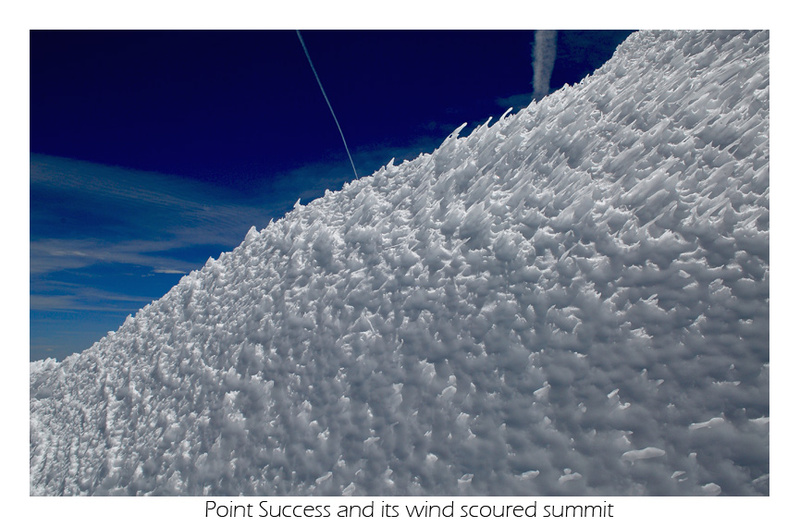 In contrast, Point Success lays directly on top of our line and has a distinct summit. Getting there required more ridge hiking than I wanted or had the energy to cross, but we continued on nonetheless and reaching the top of Point Success was rewarded with a short stay on the lee side where there was a wind protected place to rest. 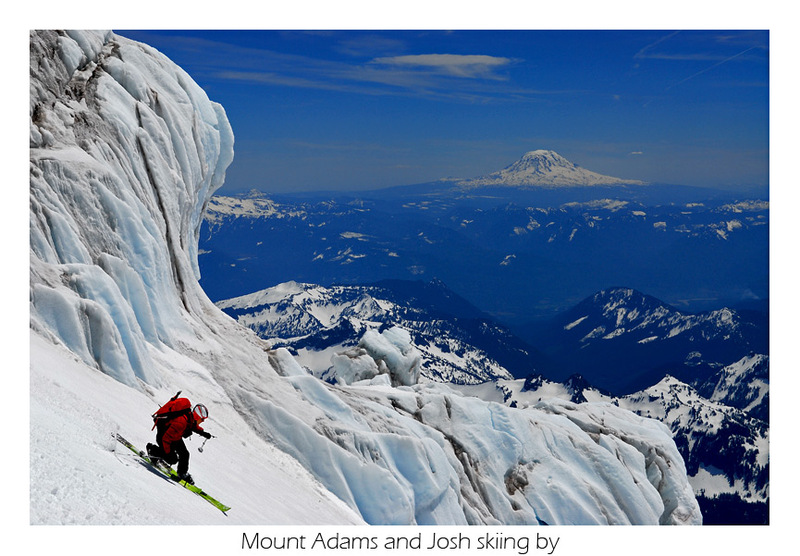 A few drinks of water, crampons and skins stashed in the packs soon made Josh and I ready to ski down....our reward. 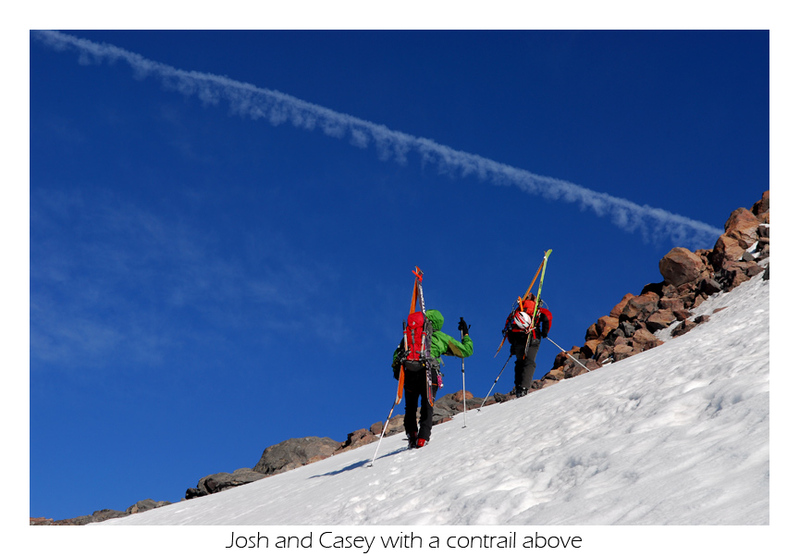 Sky and Eric's ski tracks showed they'd already descended and we assumed they were far below with Casey. The ski was awesome-beautiful corn snow, no more than a few inches deep all the way down to Camp Hazard. I had Josh stop a few times so I could get some ski shots. I was very tired, so any were an effort I didn't want to make, but the scenery in Kautz Chute was amazing. There was some ice, only a few feet of which provided a small challenge on such good snow above and below. Unless we get more winter storms up there this section may require de-skiing soon, but it isn't very long. Once through Kautz Chute, the fixed line could be seen to our left. 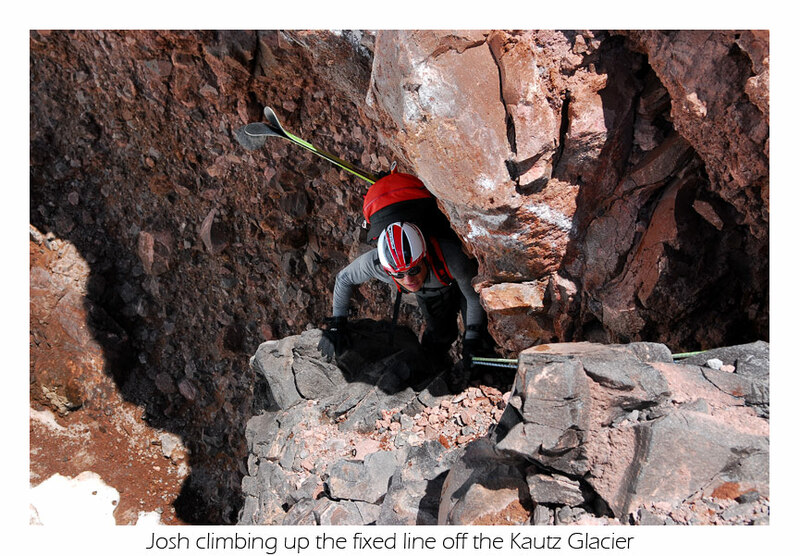 It isn't a particularly good looking route, especially for skis which can't help but knock on rocks pasted to the rock face, most halfway peeled off already. 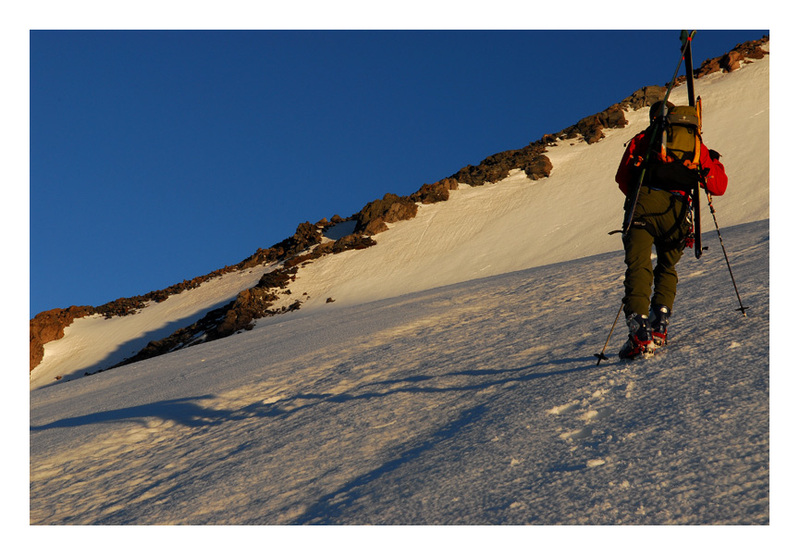 Once, a friend of mine on a steep traverse tapped a rock nearly as tall as him (over 6-ft) and it tipped over and sent him down the slope with it. He managed to sidestep the rock, swing his body around and his knee and hand found small melt holes caused by pebbles heating up and melting down into the snow. No rocks fell on us here and the climb was easy enough. Gloppy snow was hard on the legs from Camp Hazard down. There we finally caught up to the rest of our party resting on the rocks. All of us had grins and were pretty exhausted. Down here the weather was very nice and the warm temperatures were nearly unbearable. We had sluff control work to undertake from here on down. 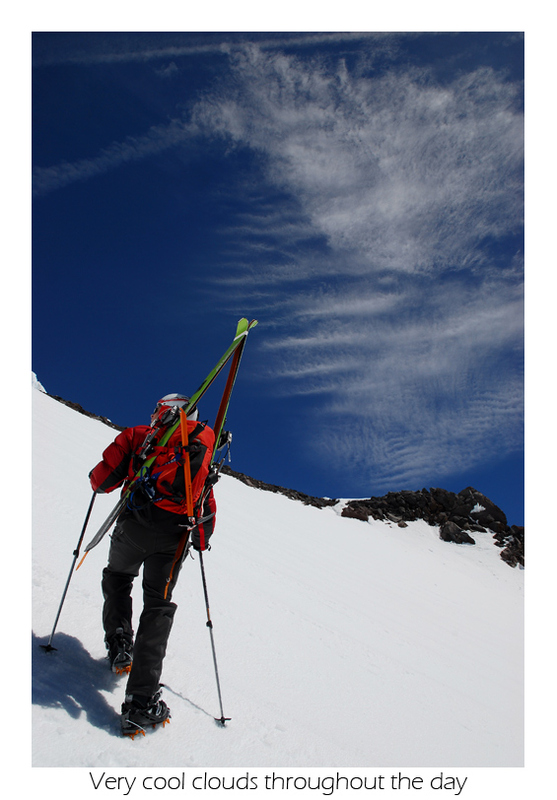 I couldn't imagine being a climber in these conditions, but if care is taken a skier can manage without unreasonable risk. 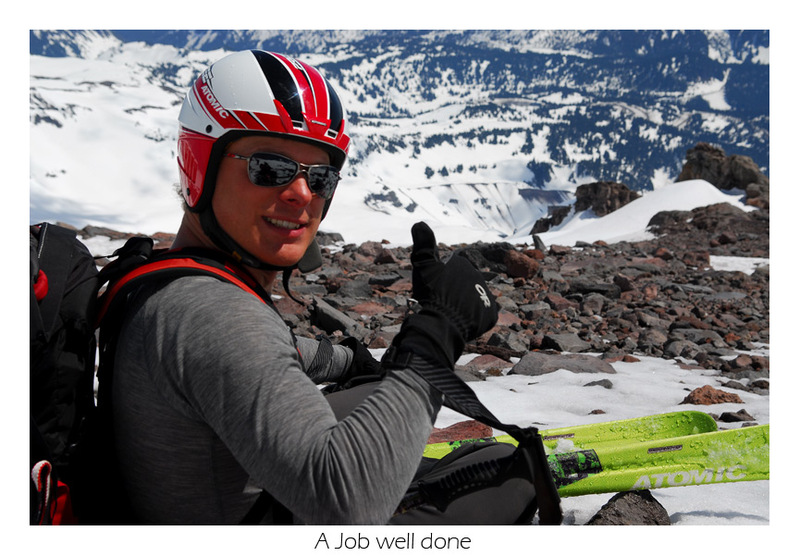 Maybe since we were having to much fun watching wet slides, we missed the correct route down the glacier and ended up skiers left of the fan, above huge cliffs. Climbing out was hardly tolerable in the heat. Tired of it, I thought there was a perfect cornice drop further along the ridge that looked good to jump and was seriously considering doing so when I hear a yell from Sky far below. What I had thought was a small cornice drop of a few feet didn't land on a nice snowfield on a nice slope, it landed onto a very small snow patch above a few hundred foot cliff. Somehow my eyes had tricked me. I didn't feel so good after that, but after filing this error away and including a note with it, "Don't jump something you don't know," I felt better. The climb out was on more gloppy snow and the crowds below Pan Point were insane! Tourists of every sort were out in force. At the parking lot cars were circling for spots. We all laid out in the parking lot, a shady group by looks: eyes sunken, hair matted, and faces burned with all sorts of gear strewn out. Looking back up the mountain from among it all, we talked about skiing on Rainier. 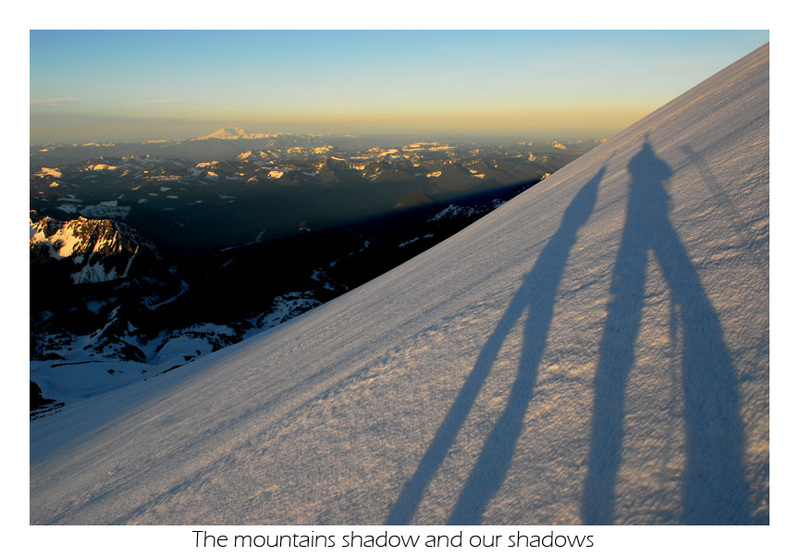 With all the snow this mountain gets, you'd be hard pressed to keep the conversation short. We sat for an hour worn and wasted, reminded again of how big and burly this mountain is.